As my first Tillie Cole book, I had no idea what to expect. I didn't really know what this book was about, but I did know that tons of people have loved it, so I knew I had to pick it up. And did you take a look at that cover? GORGEOUS. Rune and Poppy became best friends when they met as children and their bond only grew stronger as they grew older. But when Rune has to move away, both of them are devastated. Rune is even more devastated when Poppy cuts off all communication from him. Angry and hurt, Rune returns two years later as a 17-year-old determined to have some answers. OH MY GOSH THE EMOTIONS IN THIS BOOK. For some reason, my book friends (*cough* Sarah *cough*) like to tell me to read books that will tear my heart out. This book made me cry so hard and, if you know me at all, you know that I am not a book crier. This deals with the relationship between two people who have been meant to be together since they were children. Poppy is such a unique character and normally I find characters as whimsical as she was annoying, but I thought her character made sense with this premise and she was the lightness that was needed to balance out the darkness that seemed to simmer under the surface in Rune. This book was so beautiful and heartbreaking and I don't know how I made it through the whole thing. When I went to my sister to explain what had happened, I literally could not make it through talking to her without crying. This is a young adult romance, but I honestly forgot it was young adult because of how strong and true their romance was. I didn't feel like there was anything juvenile about them and they really did help shape each other into the people they ended up being. 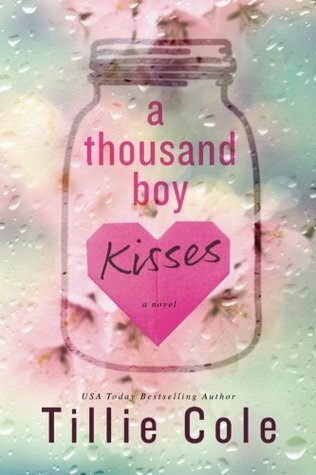 All I can say is that if you want a book that you will cry your heart out in, you have to pick up A Thousand Boy Kisses. These characters are so special and show you what it really means to be in love. I have several Tillie Cole books, got them when they were on sale, but have never read any. I have been looking at this one for awhile, because it seems to be a reader favorite of hers. I am glad you enjoyed it and your review was very helpful. Thank you for posting your thoughts!